A US$42,000 six-classroom elementary school has been dedicated to residents of Tuankan Town, in Bong County. The project was allocated by Bong’s Sen. Henry Yallah as part of the Legislative Support Projects program. Yallah said the allotment was made in the 2016/2017 national budget for the school’s construction. Lawmakers receive annual budgetary allotments for projects of their choice to be implemented within their constituency. During the dedication of the school recently to the community, Yallah called on education authorities and parents in the district to make proper use of the structure. Meanwhile, the district’s education officer, Sunnie Kpee, asked parents to send their children to school, instead of going to the farm or other a activities. Kpee praised Yallah for ensuring that allotment was made to construct the school. However, like many other schools in rural communities in Bong, the newly constructed Tuankan Town Elementary School does not have a single paid government teacher, let alone ones that are qualified. Moreover, a few community members are volunteering their services to teach the students. Kpee told Journalists that negotiations are underway to work with the county’s leadership to allot funds for teacher compensation during the upcoming county council sitting. Another official who attended the dedication program was Albert Hills, the district’s representative at the National Legislature. He particularly thanked the citizens for their support to the contractors throughout the project’s construction. The New Millennium Construction Company constructed the school. “I want to thank the senator; it takes any man time to do what he did. Many leaders don’t think about their people. He brought such a project that will allow the little ones to be qualified for tomorrow’s society,” Hills said. 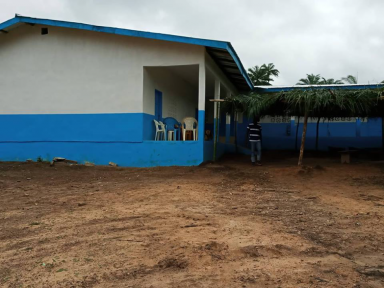 Like the district’s education officer, Hills challenged the community to maintain the facility and help encourage their children to attend the school.